By Keith Cowing on October 31, 2009 11:14 PM. Keith's note: Compare the new Vs the original goal for Save Space. Looks like expectations have dropped. By Keith Cowing on October 31, 2009 9:34 PM. This video shows Unreasonable Rocket's first launch attempt for the Northrop Grumman Lunar Lander Challenge level one prize. The rocket known as Blue Ball made a valiant effort but ran out of fuel at the end and came done with a sharp thud to the ground and appears to have damaged one of its legs. The team, a father and son combo, Paul Breed and Paul Breed, decided not to attempt a second flight today meaning they will not qualify for the level one prize. They will attempt to qualify for the second level prize tomorrow with their Silver Bell rocket. By Keith Cowing on October 31, 2009 1:39 PM. "Masten's qualification flight came at the final Lunar Lander Challenge flight window on Friday morning. During previous windows on Wednesday and Thursday the vehicle experienced communications and plumbing issues. After a small fire on Thursday afternoon the team spent most of the night engineering a solution to a small leak. The solution worked and the team successfully flew the required profile on Friday morning." "The rules have given the judges the discretion to do just about anything up to and including awarding prize money for best effort if they felt it necessary, so there may not be any grounds to challenge this, but I do feel that we have been robbed. I was going to argue that if Masten was allowed to take a window on an unscheduled day with no notice, the judges should come back to Texas on Sunday and let us take our unused second window to try for a better accuracy, but our FAA waiver for the LLC vehicle was only valid for the weekend of our scheduled attempt." By Keith Cowing on October 31, 2009 1:06 PM. By Keith Cowing on October 30, 2009 9:08 PM. "While the debate continues in Washington over the future of NASA's human spaceflight plans, contractors at Kennedy Space Center are pressing ahead with plans to lay off hundreds more workers as the date of the space shuttle retirement looms. Boeing Co. announced Friday it will shed 330 jobs at KSC, starting in January and continuing in stages through August." By Keith Cowing on October 30, 2009 8:49 PM. "The Constellation Program was a reasonable path, five years ago, when the Vision for Space Exploration was first formulated. Since then, budget shortfalls have caused significant delays. Moreover, the goals evolved into a focus on getting astronauts back to the Moon, to the development of the Ares family of rockets and the Orion spacecraft. The public generally is bored with going back to the Moon, since we already did this forty years ago." By Keith Cowing on October 30, 2009 4:07 PM. By Keith Cowing on October 30, 2009 11:50 AM. "Photographs taken by the recovery crew show the four-segment shuttle booster floating upright in the Atlantic Ocean shortly after splashdown. An initial inspection, sources said, revealed the sort of paint blistering that is typically found on shuttle boosters, along with a good sized dent in the lower segment that was photographed by divers." 30 October 11:48 am EDT update: NASA KSC speaker on Ares 1-X parachutes: "we had one good one, one completely failed one, and one partially opened. That caused the booster to hit at high speed." This vhicle had 15% more weight than the actual weight of an Ares 1 ... The dent on the booster was due to water impact ... we are not dwelling on the damage because we never planned to use this booster again. ... We do not consider this to be a significant event. By Keith Cowing on October 30, 2009 11:08 AM. "Nigeria really does have a space agency. The west African nation's National Space Research and Development Agency is already celebrating its 10th anniversary. And as America and Europe's space agencies set their sights on joint exploration of Mars, Nigeria has big plans of its own: It wants to send a Nigerian up into space in 2015, making Nigeria home to the first black African astronaut." Keith's note: Ignore the first part of the article about the stranded Nigerian in space email scam. (Pause) While some may justifiably argue that this is really a case where money needs to be spent attending to Earthly needs, why is it that poor countries like Nigeria and more prosperous, but still poverty-straddled nations like India, Malaysia, and China (to some extent) all seem to think that putting one of their citizens into space is such a big deal? After all, it was first done nearly half a century ago. It certainly can't be all the high tech spinoffs that Nigerians enjoy since 99.99% of them have never even seen "smoke detectors, implantable pacemakers ..." etc. etc. and the other spinoffs that NASA loves to incessantly wave at the general public as a rationale for NASA spending. What is it about space that excites these countries, but leaves us mostly bored - except every few years in a few states when job cuts suddenly appear and we hoist up our grand space accomplishments as an excuse reason to not put people out on the street? What have these countries discovered about space exploration and its potential that we have long ago forgotten? What would it take for such a (re)discovery to happen in America? By Keith Cowing on October 30, 2009 9:04 AM. "LRO maneuvered into its 50-km mapping orbit on September 15. The next pass over the Apollo 17 landing site resulted in images with more than two times better resolution than previously acquired. At the time of this recent overflight the Sun was high in the sky (28 incidence angle) helping to bring out subtle differences in surface brightness." By Keith Cowing on October 30, 2009 9:01 AM. "... prosecutors said Nozette claimed that in the past he had "communicated classified information" to the foreign company while working as a consultant. "In his mind, he committed actual espionage," Assistant U.S. Attorney Anthony Asuncion said during a hearing in the District's federal court. ... [Nozette] said he had made a "career choice" to become a spy and planned to leave the United States and live abroad under a false name." By Keith Cowing on October 29, 2009 10:53 AM. Keith's note: New NASA Advisory Council Communications Subcommitee chair @milesobrien just Twittered: "If you were creating an all-star team of people to help NASA improve its efforts in education and outreach, whom would you select?" By Keith Cowing on October 29, 2009 7:23 AM. "A Chevy Chase scientist accused of attempted espionage wanted $2 million for his secrets and stashed 55 gold Krugerrand coins worth about $50,000 in a California safe deposit box, federal prosecutors said." "A space exploration scientist accused of attempted espionage is scheduled to appear in court to learn whether he will have to stay behind bars while he awaits trial." By Keith Cowing on October 28, 2009 4:28 PM. "An $11 million air safety study sponsored by NASA that asked pilots to reveal mishaps and problems they encountered was so riddled with flaws that it could not provide useful insights about U.S. flight safety, according to a new review by a national scientific panel. The research project ran for nearly four years and involved telephone interviews that lasted about 30 minutes with 29,000 pilots. But it was so flawed in its design and how it was run that its results were useless for measuring safety problems or trends, according to a report released Wednesday by the National Research Council." By Keith Cowing on October 28, 2009 12:23 PM. "While the engineers have not been able to find the root cause of why the orbiter did so on Aug. 26, they are seeing a pattern among the four occurrences this year. "In all four cases the most likely scenario is that ... either one of the voltages wasn't right or the part of the device that measures voltages indicated there was a problem and there wasn't one," Erickson said." By Keith Cowing on October 28, 2009 12:13 PM. By Keith Cowing on October 28, 2009 11:34 AM. "Rising into the Florida sky, the 327-foot rocket thunders away from the launch pad, marking the first time a new vehicle has launched from the complex since the first space shuttle launch in 1981." "One question that comes up a lot is why Ares I-X has a four-hour launch window. After all, unlike the Space Shuttle, it doesn't have to rendezvous with the Space Station, so what's the challenge? Actually, there are several." By Keith Cowing on October 28, 2009 9:54 AM. "On Oct. 28 & 29, Masten Space Systems, led by former Experimental Rocket Propulsion Society (ERPS) president David Masten, will be the second of three teams attempting to complete the requirements for the Level 2 portion of the Northrop Grumman Lunar Lander Challenge (NGLLC), funded by NASA, and created and presented by the X PRIZE Foundation." By Keith Cowing on October 28, 2009 9:38 AM. "As requested by Congress, this volume reviews the effectiveness of NIAC and makes recommendations concerning the importance of such a program to NASA and to the nation as a whole, including the proper role of NASA and the federal government in fostering scientific innovation and creativity and in developing advanced concepts for future systems. Key findings and recommendations include that in order to achieve its mission, NASA must have, and is currently lacking, a mechanism to investigate visionary, far-reaching advanced concepts. Therefore, a NIAC-like entity should be reestablished to fill this gap." By Keith Cowing on October 27, 2009 12:43 PM. "The Civil Service Reform Act of 1978, Public Law 95-454 (Section 405) requires that appointments of individual members to a Performance Review Board (PRB) be published in the Federal Register. The performance review function for the SES in NASA is being performed by the NASA PRB and the NASA Senior Executive Committee. The latter performs this function for senior executives who report directly to the Administrator or the Deputy Administrator and members of the PRB. The following individuals are serving on the Board and the Committee:"
By Keith Cowing on October 27, 2009 11:23 AM. Keith's note: According to NASA: "Launch Director Ed Mango informally polled his team to ensure the vehicle and its system are all still "go." The range is not available after noon today due to reasons such as airspace and warning areas, planes operating on flight plans, and other issues. Today's launch window ends at noon.". The Ares 1-X rocket itself is all green and good to go. Winds have started to trend down and have hit - but not exceeded - the limit. 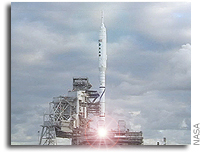 NASA was looking for a 11:20 am EDT count resume for a 11:24 am EDT launch. Weather is green on triboelectrification and is red on wind. Weather officer says that conditions for T=0 will be red for triboelectrification. LC says "We are not going to resume." Mika Brzezinski:"The flight will last 2 minutes and cost $400 million"
Heard on MSNBC at 9:48 am EDT: Jay Barbree says that Orion will carry a crew of "as many as 6 astronauts" and that the Ares 1 is the "best designed" and "safest rocket ever designed" . Heard on MSNBC at 9:57 am EDT: Jay Barbree says "We have new people who do not have experience in this office who are trying to go through a commercial launch [for crew] and if they do it will be a delay for at least a decade before we have [something for] astronauts from this country to fly upon." By Marc Boucher on October 27, 2009 9:24 AM. "At the U.S. Army's White Sands Missile Range in New Mexico, a portion of Orion's Pad Abort-1 (PA-1) test vehicle is shown from above in the Final Integration and Test Facility during preparations for the flight test. From left to right are the abort motor, the jettison motor and the interstage section not yet attached. In addition to the attitude control motor (not pictured), these motors will be used for the first Orion test of the launch abort system, PA-1." By Keith Cowing on October 26, 2009 10:11 PM. "The MINI-ME instrument is a low energy neutral atom imager. Low energy neutral atom imaging is a technique first pioneered at Goddard, that allows scientists to observe remotely various trapped charged particle populations around Earth that we would normally only be able to observe in-situ - or exactly where an instrument is," said Michael Collier, Principal Investigator at NASA Goddard." Hooray The Aerospace Alliance Is Here! By Keith Cowing on October 26, 2009 9:15 PM. "Governor Bob Riley (R-AL), Governor Haley Barbour (R-MS), and Governor Bobby Jindal (R- LA) today announced the launch of The Aerospace Alliance, a 501(c)(6) private/public organization that will establish the Gulf Coast and surrounding region as a world class aerospace, space and aviation corridor. The announcement was made before hundreds of supporters at an event in Bay Minette, Alabama." "U.S. Sens. Bill Nelson and George LeMieux said today the Northwest Florida region is destined to become a world-class home for new aviation and aerospace jobs." By Keith Cowing on October 26, 2009 3:45 PM. "JSC intends to issue modification 166, funding Task Order 2.1.8. The purpose of this task order is to develop a set of human system integration requirements for application to commercial spacecraft in support of NASA's Commercial Crew and Cargo Program (C3PO). The human system integration requirements developed under this task order shall be based on a review of existing Human Rating requirements, Spaceflight Human Systems Standards, Constellation Program requirements, Commercial Crew and Cargo Program Office operational concepts and requirements, and the Johnson Space Center Space Life Sciences Directorate Human Interface Design Handbook." By Keith Cowing on October 26, 2009 3:28 PM. "A new report from the National Research Council, AN ASSESSMENT OF NASA'S NATIONAL AVIATION MONITORING SERVICE (NAOMS), examines the NAOMS project, an anonymous survey used to collect data from commercial and general aviation pilots over several years regarding aviation safety-related incidents. The report assesses the survey methodology and analyzes the data collected. The report also provides recommendations on the appropriate use of the NAOMS data. Reporters may obtain copies of the report by contacting the National Academies' Office of News and Public Information, tel. 202-334-2138 or e-mail news@nas.edu. Advance copies will be available to reporters only starting at noon EDT on Tuesday, Oct. 27. THE REPORT IS EMBARGOED AND NOT FOR PUBLIC RELEASE BEFORE 11 A.M. EDT ON WEDNESDAY, OCT. 28." By Keith Cowing on October 26, 2009 1:56 PM. 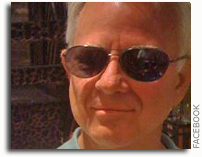 Keith's note: More on Stu Nozette from NSS Blog Editor Karen Cramer Shea (on her own blog here and here) who is clearly still confused and firmly seated on the train to Crazy Town. I would certainly hope that the NSS can do better than this in selecting an editor for their blog. Fall of a tragic hero, the earlier (original) NSS blog posting to which I responded. By Keith Cowing on October 26, 2009 11:30 AM. "NASA has completed a review of the Ares I-X development rocket's readiness for its flight test and selected Tuesday, Oct. 27, as the official launch date. 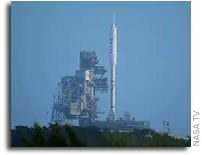 Liftoff is scheduled for 8 a.m. EDT from NASA's Kennedy Space Center in Florida." "NASA has two days - Tuesday and Wednesday - to launch the Ares I-X test rocket or it could be delayed until December or perhaps next year, said test Launch Director Jeff Spalding this afternoon. Including the Ares I-X test, Kennedy Space Center and Cape Canaveral Air Station have five launches to work over the next month - Ares, a shuttle mission, and three commercial launches." "That electric charge can interfere with communications between the rocket and the ground. Since this is a test flight, no one wants anything to block the flow of data from the rocket to eager engineers back at the Kennedy Space Center. And if the range-safety officer has to blow up the rocket during its ascent because it's misbehaving in ways that threaten life or property, you want to make sure the explosives on the rocket receive the detonation command. This isn't a concern for the space shuttles. They were designed with this phenomenon in mind. But the Ares 1-X is a different beast, and the rule has come back into play." By Keith Cowing on October 26, 2009 11:10 AM. "Brevard County officials launched a Web site, http://www.SaveSpace.us, to try to generate 500,000 letters to President Barack Obama by Oct. 31. The Save Space Web site has racked up more than 42,000 hits since its Sept. 28 launch, said Kimberly Prosser, county spokesman. The site includes six downloadable letter templates and printable posters and banners. A campaign cornerstone: Video footage of Obama's August 2008 campaign stop in Titusville, where he pledged to "help close the gap and ensure that our space program doesn't suffer when the shuttle goes out of service." Keith's note: I posted a comment about the misleading video that this group has posted on their Facebook page. Laden with depressing music, scare mongering titles, and highly edited short snippets taken from hours of Augustine deliberations, this video purports to focus on Augustine Option 4b which talks about shuttle derived launch vehicles. Well, it is actually a propoganda piece for the DIRECT concept - one of two shuttle-derived concepts briefed to the Augustine Committee. At one point NASA JSC's John Shannon, an advocate for the other shuttle-derived concept that was thoroughly briefed (yet ignored in this video), the Shuttle Sidemount HLV, is shown talking about a shuttle-derived launch vehicle while DIRECT imagery is shown. At no time is the Shuttle Sidemount concept even mentioned. Very deceptive. Well, they did not like my comment, so they removed it. This is rather odd given that a decision to go with the Shuttle-derived Sidemount option is most likely to retain current Space Shuttle jobs - just as they are right now. I guess the easiest way to deal with conflicting or critical information is to ignore it or remove it. Oh yes, "42,000 hits" since 28 September is not that much to crow about given the number of people affected by this issue and the goal of getting 500,000 letters written by this coming Saturday. Many websites that are considered "small, low traffic" do this sort of traffic in a single day. Regardless as to whether this group is referring to 42,000 "hits", "file transfers", or page views" on their website, there is a zero missing in all of their numbers that one would expect to see if their effort was actually on the path toward generating 500,000 letters by 31 October 2009. That said, this group is not sitting down but is standing up and taking some action. Inacucracies aside, that is to be applauded - and emulated. Hopefully this sort of thing can start to happen again in the future - but not just at the last second every time some scary job loss looms - but also in the quieter times when making the value of space exploration to the entire population can be done - not just focusing upon a portion of Florida. By Keith Cowing on October 26, 2009 11:00 AM. "NASA released the full text crafted by its Review of Human Spaceflight Plans Committee (the so-called Augustine committee) today. The 157-page examination lacked an endorsement of an overall strategy, but there are a few passages of interest that were not included in the summary that was released in September. Here are a few passages that leapt out at us." "NASA has been trying to explore space on a shoestring. Because the cash-starved Orion won't be ready until at least 2016, and the shuttle is being retired next year, the U.S. will be forced to launch astronauts on Russia's Soyuz spacecraft at $51 million per seat." "Houston, we have a problem: According to a blue-ribbon panel, the U.S. space program is on an unsustainable trajectory. This past week, the Human Spaceflight Plans Committee released a report saying that unless NASA receives more money fast, the space agency will have to scale back its near-term ambitions." "The government has already allocated close to $800 billion on economic stimulus, so it's difficult to understand why NASA, with a full-time and contractor workforce totaling nearly 60,000 nationwide and 18,000 in the Clear Lake area, isn't worth an additional investment to continue manned space exploration. NASA's role in stimulating technological development with widespread applications to other industries is well established." "And the two panel members in addition expressed their interest in bypassing a landing on the moon--the destination set by U.S. President George W. Bush in 2004--in favor of a lunar flyby or rendezvous with an asteroid or Martian moon." By Keith Cowing on October 26, 2009 9:28 AM. "Court records show a former government scientist accused of attempted espionage last week pleaded guilty earlier this year to overbilling NASA and the Department of Defense more than $265,000 for contracting work. The January plea by 52-year-old Stewart Nozette of Chevy Chase, Md., was detailed in court records unsealed Friday. The records state the documents were sealed because Nozette was cooperating in unrelated government corruption investigations." "According to the unsealed court documents, Nozette was charged with defrauding the government and tax evasion and pleaded guilty in January to overbilling the government $265,205 for work he and an employee did for NASA and the Defense Department between 2000 and 2006. Nozette admitted that he used that money to help pay personal credit card bills, car loans and maintenance costs for his swimming pool. He faced at least two years in prison under federal sentencing guidelines, according to the plea papers. The documents were sealed because Nozette was cooperating with authorities in unrelated investigations of government corruption, court records show." By Keith Cowing on October 24, 2009 12:09 AM. "OS: Now, let me put something to you that has been put to me. I don't necessarily agree with it but it is a sentiment that is out there. By not finding anything useful the U.S. can do in space for NASA's current human space flight budget of $7 billion or $8 billion a year, the committee failed. What's your reaction to that sentiment? JG: It's not failure to point out truth. The truth is the truth. And it is high time that national space policy was made on the basis of truth and not on the basis of convenience. It is not true to say that we found there is nothing NASA can do within its current budget. There are two options laid out in the report that NASA can do with its current budget. What we did not find was a way for NASA to do significant human exploration beyond low Earth orbit in the near term with this current budget. And I don't like that answer either but that is not going to change it." By Keith Cowing on October 23, 2009 6:06 PM. "A NASA App for the iPhone and iPod touch is available free of charge at the App Store from Apple. The NASA application will deliver a wealth of information, videos, images and news updates about NASA missions to people's fingertips." Keith's note: What I don't understand is why Mini-RF (the instrument on LRO that accused spy Stu Nozette is/was PI for) is on the main page but Hubble is not (unless you type in a search for it) and why Mars Express, an ESA mission, gets prime billing on a NASA app when NASA's Mars Reconnaissance Orbiter does not. And of course, top billing goes to "Constellation, NASA's Future" when nearly all of its hardware is still on the drawing board - except for Ares 1-X. Oh wait - I forgot - this is an ESMD app. Also ... apps for Android and other phone OS platforms would be nice too. By Keith Cowing on October 23, 2009 5:38 PM. "U.S. Rep. Robert Aderholt, R-Hallville, said the report provide no safety data that would help the White House or leaders in Congress to guide the future of NASA. U.S. Rep. Parker Griffith, D-Huntsville, said the report was incomplete, ill-conceived and would delay NASA's progress. U.S Sen. Richard Shelby said the report does not address safety concerns that could come about from extending the space shuttle past its planned 2010 retirement date and using the International Space Station as it ages. U.S. Sen. Jeff Sessions, R-Mobile, said if the Obama administration is serious about space and NASA it will make sure the extra $3 billion a year the Augustine panel said NASA needs is in the federal budget." By Keith Cowing on October 23, 2009 12:57 AM. "There are a million different routes to go where you want to go," Bolden said. "I know we want to go to Mars one of these days. How we get there is not yet decided, that's not tentative. That's constructive discussion and dialogue that will go on." "The premier finding is that the human spaceflight program that the United States is currently pursuing is on an unsustainable trajectory," said retired aerospace executive Norman Augustine, who led the panel for the past five months. "The committee charged with reviewing NASA's spaceflight program concludes that the Ares 1 rocket being developed to take astronauts into space after the Space Shuttle is retired is the wrong vehicle for the job." "And the two panel members in addition expressed their interest in bypassing a landing on the moon--the destination set by U.S. President George W. Bush in 2004--in favor of a lunar flyby or rendezvous with an asteroid or Martian moon. "The United States could get astronauts back into space faster and spend less money by scrapping the Ares rocket designed to succeed the shuttle and turning instead to public-private space taxis, a presidential advisory panel said on Thursday. "A White House panel has suggested that Nasa should scrap its investment in the Ares rocket and instead focus on exploring places beyond the moon." "It is likely that the Flexible Path approach would engender more Public Engagement than the Moon First approach. In every flight, the Flexible Path voyages would visit places where humans have never been before, with each mission extending farther than the previous one, potentially leading to a full dress rehearsal for a Mars landing," the report states." By Keith Cowing on October 22, 2009 10:31 PM. "After an extended period of writing and editing, the Augustine Committee's final report was delivered to the White House yesterday. Today it was released to the public at a media briefing held at the National Press Club in Washington, DC. 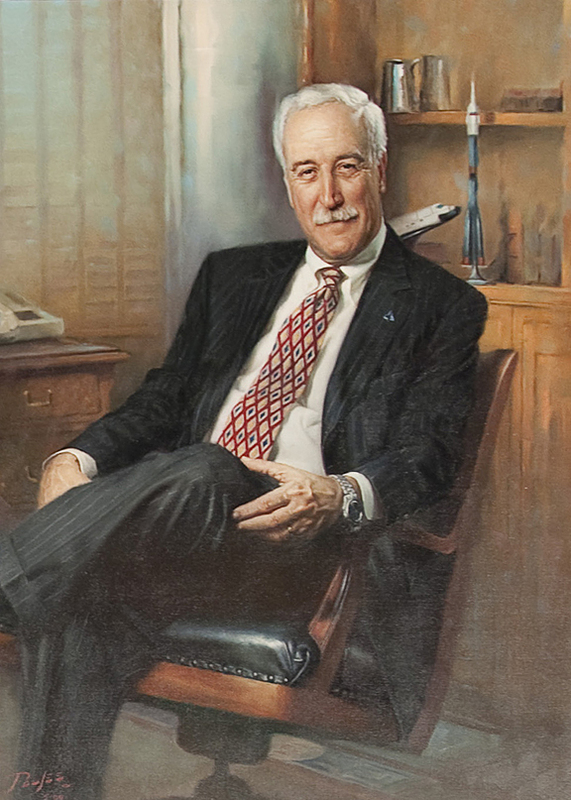 The Augustine Committee - named after its chair, Norm Augustine - is formally known as the Review of U.S. Human Spaceflight Plans Committee. The Committee was chartered earlier this year by the White House under the Federal Advisory Committee Act (FACA). As such, its deliberations and other activities are done pretty much in the open. With the advent of web streaming, and other social networking tools, nearly everything that the committee did was done in full view of the public. As such there should have not been any surprises contained in this report. That said, people still expected to see something new today such as the cancellation of Ares 1 or the selection of a new heavy launch vehicle. None of that happened. It was never going to happen. In a nutshell, the Augustine Committee viewed NASA's current human spaceflight program as being in a time of transition. Mounting costs and technical challenges had resulted in the current approach being deemed as unable to meet the goals it was intend to accomplish." By Keith Cowing on October 22, 2009 6:20 PM. "It is perpetuating the perilous practice of pursuing goals that do not match allocated resources," the report says. More specifically, the space program needs another $3 billion annually. "I've asked the president to use money from leftover stimulus funds," said Nelson, in a prepared statement. "Space and Aeronautics Subcommittee Chairwoman Gabrielle Giffords (D-AZ) added: "While I look forward to reading the Augustine panel's final report, Congress has already made its decisions on the issues considered by the panel. Now that both internal and external independent reviews have confirmed that the Constellation program is being well executed, we know what needs to be done. Let's get on with it and cease contemplating our collective navels." Keith's note: Um, with all due respect, the issue that Norm Augustine reiterated multiple times today is "not could NASA build Ares, but should it build Ares". He did not give a unequivocal backing for continuation of the program of record. Rather he said that he thought that NASA could eventually make it all work. Congress may well have "already made its decisions", but the White House may have some different ideas as to what they want NASA to do. Stay tuned. By Keith Cowing on October 22, 2009 6:04 PM. "The Committee has conducted an objective and comprehensive assessment and has found that the U.S. human space flight program appears to be on an unsustainable trajectory. Independent analysis conducted for the Committee determined that the proposed Ares I crew launch vehicle and Orion crew capsule (each part of NASA's plans for carrying astronauts to space in the future) would not become fully operational until at least 2017. However, this assumed that the International Space Station would be retired from service in 2016 - thus giving no immediate destination for the Ares I and Orion vehicles once they became available. Even with an unconstrained budget, the Committee determined that the Ares I and Orion would likely be available no earlier than 2016. Further, to enable astronauts to return to the Moon by the early 2020s, NASA would need at least $50 billion in additional funds, reflecting significant increases and schedule delays relative to initial estimates." By Keith Cowing on October 22, 2009 5:07 PM. By Marc Boucher on October 22, 2009 3:47 PM. Our poll question is: Which of the three paths presented by the Review of U.S. Human Spaceflight Plans Committee do you prefer? By Keith Cowing on October 22, 2009 12:15 AM. "The nation is facing important decisions on the future of human spaceflight. Will we leave the close proximity of low- Earth orbit, where astronauts have circled since 1972, and explore the solar system, charting a path for the eventual expansion of human civilization into space? If so, how will we ensure that our exploration delivers the greatest benefit to the nation? Can we explore with reasonable assurances of human safety? Can the nation marshal the resources to embark on the mission?" Poll: Which of the three paths presented by the Review of U.S. Human Spaceflight Plans Committee do you prefer? By Keith Cowing on October 21, 2009 11:51 PM. Keith's note: This NASA/National Institute of Aerospace-sponsored event is all about facilitating interaction, fostering communication ... all that socially aware networking goodness etc. So ... I go to the website for this event to see how I can register and attend and ... there is no way to do that. The NASA Gen Y folks are all excited about a NASA-centric TED event - yet no one seems to know how the rest of us can attend and (perhaps) participate. The organizers state that "The TEDxNASA attendees will be just as extraordinary as the speaker line-up; they will include internet pioneers, local technology leaders, movie producers, architects, creative directors, CEOs, entrepreneurs, authors, engineers, investors, celebrities, scientists and leading opinion formers of every kind. Indeed, we expect all 1,700 spaces at the Ferguson Center to be occupied." Yet I cannot register online? Where are all of these amazing people coming from? How do they register? FAIL. Keith's update: There is a poster on the website which has small print saying "by invitation only - tickets required". And Opennasa.com says that tickets will be available to the public on 16 November - less than a week before the event. So much for advance planning. These TED events can be expensive to attend - with ticket prices of $1,000 - or more. What sort of message is NASA sending when it mounts exclusive events such as this? Who decides which taxpayers can attend, and who gets the money from ticket sales? By Keith Cowing on October 21, 2009 10:58 PM. "Maybe ever since the Moon landing, it's been pretty easy to overestimate the success of our space programs--when we want to go somewhere or launch something, we just do it, right? In actuality, space exploration remains a high risk endeavor, as the various Space Shuttle disasters have proven. And going to Mars? Maybe it's out closest planet, but going there isn't as easy as it seems. To prove it, here's a clever graph of all the missions ever sent to Mars. As you can see, it's basically a bar graph; missions to Mars as listed chronologically, and the mission result is coded by how close the corresponding bar reaches to Mars." By Keith Cowing on October 21, 2009 10:12 PM. "NASA's Johnson Space Center in Houston kicked off an experimental programming competition today in conjunction with TopCoder, Inc. and researchers from Harvard Business School and London Business School. The competition, conducted for the centers Space Life Sciences Directorate (SLSD), is aimed at developing algorithms that optimize medical kits for long-duration human space exploration." By Keith Cowing on October 21, 2009 6:00 PM. "Republican Senator Richard Shelby launched a preemptive strike on President Barack Obama's blue ribbon space panel ther day before its due to release its final report, calling the committee's findings "worthless." Shelby, a staunch defender of NASA's Marshal Space Flight Center In Huntsville, Alabama, said in a Senate floor speech that the committee failed to consider safety when it ranked various rocket options for the White House to consider. "Without an honest and thorough examination of the safety and reliability aspects of the various designs and options for manned space flight, the findings of this report are worthless," said Shelby." "I certainly hope we can meet, discuss his wants for NASA, provide him with the information he needs and hear his decisions before the end of the year," Bolden told The Times after he made a presentation at the Von Braun Center today. "The sooner we can move forward the better. However, the president has a lot of decisions about a number of areas to make. We are one on his list." By Keith Cowing on October 21, 2009 5:32 PM. "In his grand novel about the space program, author James Michener put it plainly. "The world is called dark," Michener wrote, "not because the sun fails to shine, but because people fail to see the light." So let there be light. America, will you urge the president to pick a bold new mission for our nation in space? Call or text the president at 202-456-1111 or Switchboard: 202-456-1414. or email him at http://www.whitehouse.gov/contact." By Keith Cowing on October 21, 2009 4:16 PM. "During the testing, vibrations were mechanically introduced into the rocket by four hydraulic shakers simulating the same kind of vibrations expected during flight so the effects could be monitored. A sway of the vehicle was then manually introduced (with a little help from Mission Manager, Bob Ess and Deputy Mission Manager Steve Davis) to create a lateral, back and forth motion so the team could measure how the rocket reacts." By Keith Cowing on October 21, 2009 1:56 PM. Keith's note: Folks at Ames are taking the lack of a big LCROSS plume all in stride. This is from someone@arc.nasa.gov: "I thought you might enjoy a little piece of promotional material created for an Ames Exchange Activity Fair (re: No Plume?!)" By Keith Cowing on October 21, 2009 1:36 PM. "Today, Congresswoman Suzanne Kosmas (FL-24) and Congressman Bill Posey (FL-15) introduced legislation to help minimize the impact of the impending human spaceflight gap on Central Florida's economy by encouraging the development of the commercial spaceflight industry. The bipartisan bill would establish a competitive Commercial Space Transportation R&D "Centers of Excellence" (COE) program within NASA." Keith's note: This latest announcement seems to be all about Florida's economy, not any other part of the U.S., NASA, or commercial spaceflight (but I guess they can all play too). Why does NASA need to be brought into the mix and make things more complex when the private sector seems to be doing just fine on its own? The most effective way to use tax dollars, if that is what the authors of this bill want to do, would be to buy tickets on these new commercial rockets. By Keith Cowing on October 21, 2009 1:24 PM. "Space Exploration Technologies (SpaceX) successfully conducted two static firings of the first stage, nine engine cluster for its Falcon 9 launch vehicle. The firings took place at SpaceX's Texas Test Site, a 300-acre structural and propulsion testing facility just outside of Waco, Texas. With completion of these tests, the first stage has now passed both structural and propulsion acceptance testing and will ship to Cape Canaveral in preparation for the first flight of Falcon 9." By Keith Cowing on October 21, 2009 12:32 PM. - Direct links to sample letters: http://is.gd/4uhEI (HTML) http://is.gd/4uhGE (DOC). Print, sign, & send. Thanks for your time and support! - More lawsuit info (if you want to know what you're supporting): http://hspd12jpl.org . Basically, gov says: give up all privacy to keep job. By Keith Cowing on October 21, 2009 11:39 AM. Keith's note: This bizarre comment (below) by Karen Cramer Shea was posted on the National Space Society blog for a while - it has since been taken down. (Cached version at Google). Karen has posted some odd things before but this makes me wonder if there is any adult supervision in place at the NSS since she is clearly on the train to Crazy Town. "May have bent the rules too far this time", Karen? According to the charges filed against Nozette, he agreed to betray his country's military secrets for money. There's a word for that and it is not "hero", Karen. The word is "traitor". What leaves me baffled is how an otherwise wonderful organization like the National Space Society can ever expect to affect the general population's view about space exploration when goofy, insensitive, and ill-advised rhetoric like this appears on their official blog. Continue reading NSS Blog Needs Adult Supervision. By Keith Cowing on October 21, 2009 11:15 AM. "NASA Administrator Charles Bolden will take part in the Wernher von Braun Symposium and dinner held at the Von Braun Center and visit four local schools. In the morning, Bolden will visit Lincoln Elementary School, Columbia High School and Huntsville Center for Technology. Bolden is also scheduled to visit Horizon Elementary School in Madison." By Keith Cowing on October 21, 2009 10:49 AM. "A hospital in Dallas is using NASA technology to improve its patient flow. The technology - called the On-Cue system - uses artificial intelligence to automate patient flow and improve efficiency. Once the system is running, doctors and nurses will be able to see each patient's daily schedule, which will update in real-time. Doctors hope it will help them deal with unpredictable changes and miscommunication." "The genesis of the On-Cue technology comes from Allocade's founder and chief technology officer, Don Rosenthal, who led the Artificial Intelligence Applications Group at the NASA Ames Research Center. The On-Cue engine is the result of Rosenthal's work to use the limited resources of the Hubble Space Telescope." Keith's note: I went to NASA's Spinoff database to see if I could find any information. None was found. There is no mention of this online at NASA ARC or anywhere else. It is curious how NASA thumps its chest over old spinoffs but when new ones make the news NASA hasn't a clue that it has even happened. By Keith Cowing on October 21, 2009 12:48 AM. By Keith Cowing on October 20, 2009 11:59 PM. @NASAWatch: Dear @GoBoldlyNASA stop drinking the NASA Koolaid and spend some time in the real world where people are losing their jobs. By Keith Cowing on October 20, 2009 10:20 PM. "You may not know it, but NASA also has the authority to fund prizes. Over this weekend, NASA just held a competition in California with $750,000 in prizes for anyone in America who could move the most "regolith" --- or moon dirt --- with a robot. Twenty-three teams competed. The winning team is "Paul's Robotics", led by a young man by the name Paul Ventimiglia. Paul not only beat out 22 other competitor teams, he beat teams of professional aerospace engineers, and teams of world-class robotics experts. Paul is a college student at Worcester Polytechnic Institute in Massachusetts. He heard about the competition from a high school teacher. Now that is inspiring." By Keith Cowing on October 20, 2009 9:12 PM. "A federal judge ordered that a Chevy Chase scientist remain jailed on a charge that he tried to pass national secrets to the Israeli government in exchange for $11,000." "Israeli and American sources said on Tuesday that Nozette had business dealings with Israel Aerospace Industries." "Nozette, who is currently associated with the Lunar and Planetary Institute (LPI) in Houston, Texas, became principal investigator of a bona fide radar instrument onboard the Lunar Reconnaissance Orbiter now orbiting the moon and co-PI of a similar radar on the now-defunct Chandrayaan-1 spacecraft orbited by India." By Keith Cowing on October 20, 2009 9:05 PM. "Today, the U.S. House of Representatives passed H.R. 3819, a bill to extend the commercial space transportation liability regime, by a voice vote. H.R. 3819, sponsored by Science and Technology Committee Chairman Bart Gordon (D-TN), was first established by Congress as part of the Commercial Space Launch Act Amendments of 1988 and has been extended four times since its original enactment. The current liability risk-sharing regime extension expires at the end of the year; H.R. 3819 would extend it for three more years." By Keith Cowing on October 20, 2009 5:27 PM. "EADS, a global leader in aerospace, defense and related services, has named Sean O'Keefe as Chief Executive Officer to lead the operations of EADS North America. His appointment is effective November 1, 2009 and he will become a member of the EADS NV Executive Committee beginning January 1, 2010." 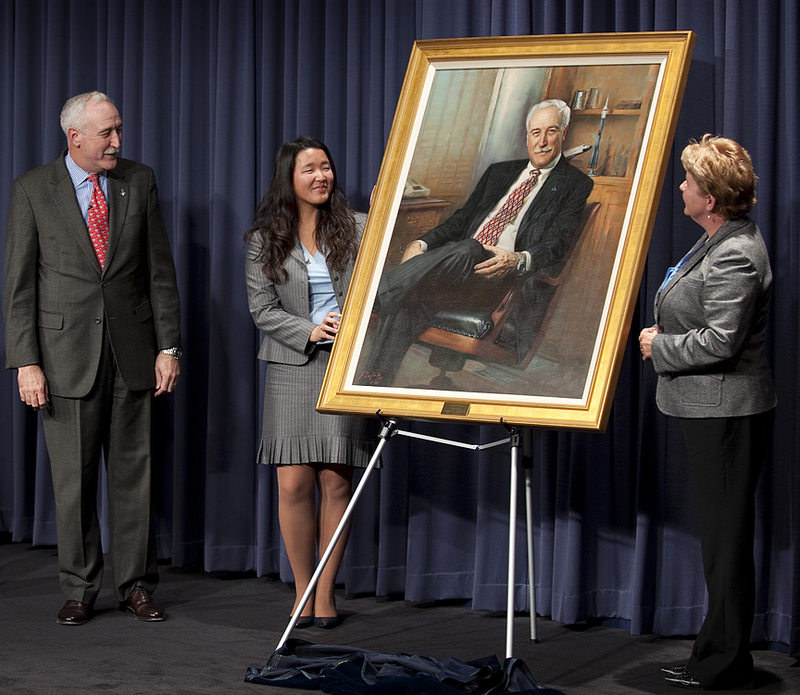 Keith's note: Yesterday, Sean O'Keefe's formal portrait (larger view) was unveiled at NASA Headquarters. Present at the event were O'Keefe, his daughter Lindsey, and wife Laura (photo by Bill Ingalls). By Keith Cowing on October 20, 2009 10:21 AM. "For the first time in more than a quarter century, a new vehicle is sitting at Launch Pad 39B at NASA's Kennedy Space Center in Florida. The Ares I-X flight test vehicle arrived at the pad atop of a giant crawler-transporter at approximately 7:45 a.m. EDT Tuesday. The crawler-transporter left Kennedy's Vehicle Assembly Building at 1:39 a.m., traveling less than 1 mph during the 4.2-mile journey. The rocket was secured on the launch pad at 9:17 a.m. The vehicle is scheduled to launch at 8 a.m. on Oct. 27. This test flight of the Ares I-X rocket will provide NASA an early opportunity to test and prove hardware, models, facilities and ground operations associated with the Ares I launch vehicle." By Keith Cowing on October 19, 2009 6:31 PM. "A criminal complaint unsealed today in the District of Columbia charges Stewart David Nozette, 52, of Chevy Chase, Maryland, with attempted espionage for knowingly and willfully attempting to communicate, deliver, and transmit classified information relating to the national defense of the United States to an individual that Nozette believed to be an Israeli intelligence officer." "Stewart Nozette, Mini-RF Principal Investigator (on Lunar Reconnaissance Orbiter) and Co-investigator (on Chandrayaan-1)." During one meeting, Nozette indicated he could be paid in cash up to $10,000. "Cash is fine...[I know] how to handle cash...you buy consumables...cash is good for anything...you can eat it, drink it or screw it." "Mr. Nozette was so proud of his access to state secrets that he recited from memory information that the complaint said was highly classified. Indeed, Mr. Nozette bragged he had a "Q clearance" between 1990 and 2000, "which involved all aspects of nuclear weapons programs," court papers said." "The Justice Department and the attorney's office filed papers in U.S. District Court in Greenbelt June 30 on behalf of NASA's Office of Inspector General based at Goddard. The papers say the nonprofit group refused to fully comply with a subpoena, including a request for bank records and tax documents for 2004 and 2005. The nonprofit is run by Stewart Nozette, who was a staff member at the National Space Council under President George Bush." By Keith Cowing on October 19, 2009 4:27 PM. "Human Space Flight Review Committee Chairman Norman Augustine will hold a press conference at 1 p.m. EDT, on Thursday, Oct. 22, in the Zenger Room of the National Press Club, 529 14th St. NW, in Washington. Augustine will be accompanied by committee member Ed Crawley. Printed copies of the committee's final report will be available during the press conference and an electronic copy of the report will be posted to the committee's Web site at the start of the briefing." By Keith Cowing on October 19, 2009 2:07 PM. "Southwest of Rowland crater on the Moon's farside, a 15 km diameter unnamed crater exhibits many boulder trails on the crater walls in this Lunar Reconnaissance Orbiter image. The boulders range from 1 m to 15 m across and mark a path downslope to the crater floor from a higher elevation." "A boulder track is visible in the center of this Mars Reconnaissance Orbiter subimage. The track formed on the sloping wall of an impact crater when a rock bounced or rolled downhill leaving behind marks on the surface. In the full image, you can see its whole path, starting from a cliff to the east, from which it presumably originated." By Keith Cowing on October 19, 2009 12:16 PM. "Nineteen teams pushed their robotic competitors to the limit and three teams claimed a total of $750,000 in NASA prizes for their hard work and innovation at this year's Regolith Excavation Challenge held at NASA's Ames Research Center on Moffett Field. After two days of intense competitive drama, organizers conferred Paul's Robotics of Worcester, MA, with the first place title, second went to Terra Engineering of Gardena, CA, and Team Braundo of Rancho Palos Verde, CA, took home third." By Keith Cowing on October 19, 2009 11:33 AM. "A blue-ribbon panel on human spaceflight recently declared Mars to be NASA's ultimate objective, but admitted humans aren't going there any time soon. In fact, the Augustine panel appointed by President Barack Obama said that without a substantial infusion of cash, NASA couldn't even send humans back to the moon in the next few decades. Depressing news, indeed, for the city that trains and houses astronauts. But what if NASA could land astronauts on Mars in a decade, for not ridiculously more money than the $10 billion the agency spends annually on human spaceflight? It's possible, say some space buffs, although there's a catch. The astronauts we'd send would never come home." By Keith Cowing on October 18, 2009 8:47 PM. 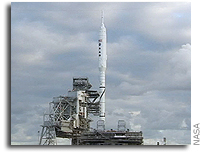 "In the Vehicle Assembly Building at NASAs Kennedy Space Center in Florida, a time lapse camera documented the buildup of the Ares I-X flight test rocket. The first video was on Nov. 3, 2008 and the final video was on Aug. 30, 2009." "NASA has rescheduled to Tuesday, Oct. 20, the rollout of the Ares I-X rocket to Launch Pad 39B at the Kennedy Space Center in Florida." By Keith Cowing on October 18, 2009 7:47 PM. "There's not much in the ice-covered lakes in the McMurdo Dry Valleys to interest anglers looking to land the big one. But for scientists who want to know more about some of Earth's earliest organisms -- and, by extension, to recognize what life may look like on other planets -- those unique ecosystems represent a useful portal to the past. Dale Andersen, Dawn Sumner and the rest of their team will spend nearly two months camped out at Lake Joyce in the Pearse Valley to understand more about those behaviors. Several team members, including Andersen, will actually scuba dive in the lake, using fluormeters and microelectrodes while underwater to detect, measure and quantify photosynthetic activity of the benthic mats and obtain samples for lab work on the surface." By Marc Boucher on October 17, 2009 11:47 AM. "NASA's Lunar CRater Observation and Sensing Satellite (LCROSS) was a smashing success, returning tantalizing data about the Centaur impact before the spacecraft itself impacted the surface of the moon. Last week, plunging headlong into Cabeus crater, the nine LCROSS instruments successfully captured each phase of the impact sequence: the impact flash, the ejecta plume, and the creation of the Centaur crater. "We are blown away by the data returned," said Anthony Colaprete, LCROSS principal investigator and project scientist. "The team is working hard on the analysis and the data appear to be of very high quality." By Keith Cowing on October 17, 2009 10:03 AM. "NASA is considering cutting as much as 20 percent of its employee costs on the manned space program -- including jobs at Houston's Johnson Space Center -- in hopes of salvaging money for ambitious back-to-the-moon plans, NASA Deputy Administrator Lori Garver has told contractors for the agency. The effort by Garver, a Clinton-era NASA official known for her willingness to shake things up, could potentially reap savings of $1.5 billion to $2 billion annually over the next two years on space operations and acquisition of the next generation spacecraft. " "In "NASA considering job cuts" (Page A1, Thursday), the Houston Chronicle incorrectly reported that NASA Deputy Administrator Lori Garver told contractors that the agency "is considering cutting as much as 20 percent of its employee costs on the manned space program." Garver has not initiated any discussions with NASA contractors in an effort to reduce jobs. In fact, it was the contractor community that first approached NASA with ideas on how it could restructure existing work to reduce costs. The article also suggested that as much as $2 billion could be saved. NASA has not attached any specific cost-reduction targets as a part of ongoing assessments of future exploration activities. The report's presumption that NASA is proactively asking contractors to cut jobs is unfortunate and incorrect, and the article assumes that the end result will have a negative impact on our work force when the opposite is possible. No specific actions will be considered until the White House makes a final decision regarding the future of human spaceflight. Robert Jacobs, assistant administrator for public affairs (acting) NASA headquarters, Washington, D.C."
By Keith Cowing on October 16, 2009 2:07 PM. "NASA has been recognized for 40 years of shared project management success by the Project Management Institute, or PMI, of Newton Square, Pa. "NASA has advanced the discipline of project, program and portfolio management by example," said Ricardo Viana Vargas, chairman of the PMI Board of Directors during their Global Congress-North America annual conference that took place in Orlando, Fla., in October. Vargas also noted that 2009 marks the 40th anniversary of the founding of PMI and the Apollo 11 moon landing." By Keith Cowing on October 16, 2009 2:02 PM. "After reviewing agency policies, procedures, coordination and collaboration mechanisms, and selecting three NASA areas for in-depth review, namely higher education, fundamental aeronautics, and Earth Science projects related to climate and weather research, GAO found that: No duplication was found in the areas selected for an in-depth review; Policies, procedures and mechanisms are in place to avoid duplication; and NASA personnel actively seek to coordinate and to avoid duplication with other federal agencies." By Keith Cowing on October 15, 2009 10:42 PM. "... we firmly support the findings of the Augustine Committee, a presidential blue ribbon panel that has endorsed commercial human spaceflight. Sally Ride, one of America's most well-known astronauts and a member of the committee, put it best when she said, "We would like to be able to get NASA out of the business of getting people to low Earth orbit. We wholeheartedly agree. NASA should put its unique resources into pushing back the final frontier and not in repaving the earth-to-orbit road it cleared a half century ago." Paul Martin = NASA's New IG? By Keith Cowing on October 15, 2009 10:35 PM. "Paul Martin -- the man who would become NASA's next chief watchdog -- is scheduled to appear this afternoon for a confirmation hearing before the Senate Commerce, Science and Transportation committee and soon could fill the contentious position of NASA Inspector General." By Keith Cowing on October 15, 2009 8:21 PM. "On Monday 19 October 2009, astronomers will report at the international ESO/CAUP exoplanet conference in Porto, Portugal, on a significant discovery in the field of exoplanets, obtained with the High Accuracy Radial Velocity Planet Searcher, better known as HARPS, the spectrograph for ESO's 3.6-meter telescope." "We report here the detection of an additional planet - GJ 581e - with a minimum mass of 1.9 M_earth With a period of 3.15 days, it is the innermost planet of the system and has a 5% transit probability." NASA Watch Poll - Plain Text or HTML Newsletter? By Marc Boucher on October 15, 2009 2:34 PM. Marc's note: In our continuing efforts to upgrade the SpaceRef Network we're considering how best to improve our newsletter which is sent out every week day. Would you prefer the SpaceRef - NASA Watch newsletter be sent to you in plain text or HTML? By Keith Cowing on October 15, 2009 1:30 PM. This image was taken by the High Resolution Imaging Science Experiment (HiRISE) aboard the Mars Reconnaissance Orbiter. Larger image and further information. Continue reading Highlighting NASA on WhoRunsGov.com. By Keith Cowing on October 15, 2009 2:08 AM. Keith's note: A NASA Watch reader attending the IAC in South Korea sent me this cellphone photo (with her apologies for its poor quality) of a proposed space station China is thinking about building. Looks a bit like Mir, yes? You can watch China's IAC presentation here on YouTube. By Keith Cowing on October 15, 2009 1:43 AM. "Dear Administrator Bolden: At your urging below (and that of many employees who contacted me since your email), I submitted the following 1000-character SAVE award proposal. Reversing Full-Cost Recovery of Civil Service Salary at NASA: Directly allocate civil-servant salary to NASA Centers in FY10 Op Plan. In 2004, NASA buried salary in program funds allowing improper re-allocation with little transparency or accountability. Tracking labor under this new policy wastes at least $50 million annually. The process requires at least a half-dozen additional outsourced accountants per Center (>$10 million in needless procurement but perhaps twice that). Continue reading SAVE Award Proposal From ARC Union. By Keith Cowing on October 14, 2009 6:46 PM. "Both large, experienced companies like Boeing, and new entrepreneurial firms like Bigelow Aerospace and SpaceX, believe in the value of commercial crew. The Atlas 5 has already proven itself more than capable of delivering high-value cargo, and, if a commercial crew program is initiated, the Atlas will readily prove itself capable of delivering crew to LEO. Herein lies the answer to your human spaceflight dilemma. A commercial crew program can easily return Americans to space in a mere four years for the amount of funding recommended by the Augustine Committee." Keith's note: When I originally posted a link to this article last night I was able to access and read it even though I do not subscribe to Space News. Now Space News/Space.com has decided to shut off free access and only make it available to paid subscribers. As such, I have posted the letter here, courtesy of Bob Bigelow: "An Open Letter to NASA Administrator Charles Bolden From Robert Bigelow"
By Keith Cowing on October 14, 2009 4:23 PM. Keith's note: Starting on 19 October Shana Dale will be the new Senior Vice President of Space and Earth Technology Services (SETS) Sector for Perot Systems. This is one of the sectors within Government Services' Federal Civilian Division. She will be responsible for leading an organization that delivers science, engineering, consulting and IT services to NASA and NOAA clients. She will also continue to serve as a Senior Fellow at the Potomac Institute for Policy Studies; an advisory board member for Rohati; and a member of the Biological Sciences Experts Group, Counterproliferation Center, Office of Director of National Intelligence. By Keith Cowing on October 14, 2009 3:46 PM. "Dr. Rodger Doxsey, head of the Space Telescope Science Institute's (STScI) Hubble Mission Office, passed away on October 13 after a prolonged illness. The New York native was 62 years old. Doxsey oversaw Hubble science operations at STScI in Baltimore, Md., for nearly three decades." By Keith Cowing on October 14, 2009 2:15 PM. "After a rocky start and then a stellar 26-year performance, NASA's Tracking and Data Relay Satellite - 1 (TDRS-1) is scheduled for decommissioning on October 28. Communications equipment that links TDRS-1 to the ground has failed and without this capability it can no longer relay science data and spacecraft telemetry to ground stations located at the White Sands Complex in Las Cruces, N.M., and on Guam." More information. By Keith Cowing on October 14, 2009 12:28 AM. "NASA is partnering with the U.S. Air Force Research Laboratory to develop a technology roadmap for the commercial reusable launch vehicle, or RLV, industry. "NASA is committed to stimulating the emerging commercial reusable launch vehicle industry," said Lori Garver, deputy administrator at NASA Headquarters in Washington. "There is a natural evolutionary path from today's emerging commercial suborbital RLV industry to growing and developing the capability to provide low-cost, frequent and reliable access to low Earth orbit. One part of our plan is to partner with other federal agencies to develop a consensus roadmap of the commercial RLV industry's long-range technology needs." By Keith Cowing on October 14, 2009 12:17 AM. By Keith Cowing on October 13, 2009 10:36 PM. Keith's note: Mutiple sources report that the Augustine Committee's Report will be formally delivered on 21 October. By Keith Cowing on October 13, 2009 10:30 PM. "What was surprising was the degree to which Bolden had clearly already decided that Evolved Expendable Launch Vehicles were not going to be a part of that future. Despite this journalist's prodding about the interest showninEELVs during the Augustine review Bolden was very clear, they were not man rated and multiple launch scenarios with LEO rendezvous and docking was just a no-no; so this was one formertwo-star US Marine Corp general this blogger decided it was not worth arguing with"
Keith's note: From what I hear from in and around the 9th floor, Charlie Bolden's actual opinion (and that of those around him) is somewhat different than is portrayed in Hyperbola. While there is not much interest at NASA in the evolution of EELVs towards providing a heavy launch vehicle capability, there is certainly continued interest in the use of EELVs as part of a commerical crew launch capability. As such EELVs most certainly have not been ruled out or seen as being "dead" as an option. Stay tuned. The Augustine report lands at the White House next week and then a lot of things will start to break loose. By Keith Cowing on October 13, 2009 10:02 PM. "Asked what bugs them most about NASA outsourcing the job of flying crew to the International Space Station, some astronauts roll their eyes and say: "Dragon." That's the name of the capsule being built by SpaceX, the aerospace startup founded by Internet tycoon Elon Musk, a capsule designed to be fully automated. But with no controls to "fly" their ride, astronauts fear they'll be "Spam in a can" -- little more than human cargo. And if they don't pilot a ship, they worry, how can they keep the fleet of T-38 jets that are the symbol of the astronaut corps?" By Marc Boucher on October 13, 2009 6:31 PM. "Ben Shelef of the SpaceWard Foundation reports that he has secured a date for this years Power Beaming Challenge AKA the Space Elevator Games with up to $2,000,000 in NASA Centennial Challenge prize money at stake now that the previous technical issues have been resolved. Three teams have qualified for the games with a fourth attempting to qualify. It appears that this time around someone will win at least level 2 in prize money. The competition is scheduled for the week of November 2 at NASA's Dryden Flight Research Center at Edwards Air Force Base near Mojave, California." By Keith Cowing on October 13, 2009 4:57 PM. By Keith Cowing on October 13, 2009 12:38 PM. By Keith Cowing on October 13, 2009 11:09 AM. Keith's note: The Coalition for Space Exploration put an advisory out this morning about some public service announcement videos they produced for www.KeepAmericaInSpace.com. The first one is above, the second is below. These are certainly nicely made videos. My prime criticism, however, is that after all the nostalgic imagery and emotions are brought forth, viewers are not told what specific threats are being made to American space exploration and what specific things they need to do to stop these threats from affecting America's space program. All you get are hints and vague suggestions that things might not continue - with no explanation as to why. If these videos are meant to be a call to action, then they are missing some critical components. Why do we need to Keep America In Space? What (or who) is threatening to prevent this? Is it President Obama who is doing this? Members of Congress? These videos impart a sense that things are going OK as they are. If so, then why make the video in the first place? What are you asking viewers to do - and to think? Who do they contact in order to stop these threats? Congress? The White House? NASA? What do they say? What needs to be fixed? If something needs to be done then you need to give people the tools to fix things and a "to do" list to implement if you want things to be fixed. You can't just drop hints and expect things to happen. These ads (again, nicely done from a production standpoint) seem to be aimed at people who already support space exploration. In other words, more choir practice. When will the Coalition - and all "space advocates" - finally break this habit? You really do not need to convince the faithful. They are already in the tank. These videos are described as "public service announcements". You need to reach out into the real world i.e. the "public" and make the discussion resonate with life outside of the space community. You know, bad economy, global warming, etc. Until that happens, these ads just sound like they are saying "you should support space because we are inspired by it - and because we work here". Continue reading A Vague Call To Action. By Keith Cowing on October 13, 2009 10:38 AM. This GeoEye-1 satellite image shows the LCROSS crater impact area on the Moon. This image was taken when the GeoEye-1 Earth-imaging satellite was on the dark side of the Earth over the central Pacific heading northward at a speed of 4 miles per second. The image was taken 47 seconds after Centaur's impact. Resolution is about 230 meters. By Keith Cowing on October 13, 2009 10:23 AM. This fascinating graphic by Sean McNaughton at National Geographic shows all interplanetary missions since the dawn of ths Space age. By Keith Cowing on October 13, 2009 12:45 AM. "A record number of entrants have signed up to compete in the 2009 Regolith Excavation Challenge and its whopping $750,000 prize money. Twenty-three teams have fulfilled the application requirements to compete in the October 17 and 18 event at the NASA Ames Research Park at Moffett Field in Mountain View. The competition requires teams to build a roving lunar excavator that can "navigate, excavate, and transfer 150 kg of simulated lunar regolith (moon dirt)" into a collector bin within 30 minutes. As part of NASA's Centennial Challenges designed to incubate cutting-edge aerospace technology through non-traditional incentives and public competition, the competing excavators must carry their own power source and are required to be controlled remotely in a way that mimics the logistics of lunar surface communications. Each team has just one chance at the prize. Thirteen of the teams are returning to compete after having attempted in prior years." By Keith Cowing on October 12, 2009 9:08 PM. Rocket scientist, inventor, classic car enthusiast, green thumb, and loving husband and father, Robert C Schindler of Rancho Murieta CA died on October 9 at his home, surrounded by family. He was born on April 5 1928 in Buffalo NY, one of identical twin brothers, to Carl Joseph and Marion Tangelder Schindler. He was 81. Continue reading Robert C. Schindler. By Keith Cowing on October 11, 2009 11:10 PM. My overall reaction is 'what a fcking mess' - they make empty claims of 'possible' this and'could result in' that with no data, they contradict themselves by claiming to be worried about life cycle cost and then pushing 'options' that actually are WORSE for LCC, they dismiss anything positive about Ares I or Constellationin general, base theirfindings on a vacuum of systems engineering or responsible programmaticassessments, and ignore THEIR OWN statements from their public sessions that'any change in path should be compelling' by being dismissive ofCx as defined. By Keith Cowing on October 11, 2009 10:21 AM. "International Space Station Expedition 20 Commander Gennady Padalka and Flight Engineer Michael Barratt landed their Soyuz TMA-14 spacecraft on the steppes of Kazakhstan Sunday, wrapping up a six-month stay. Joining them was spaceflight participant Guy Laliberte, who spent 11 days in space. Padalka and Barratt spent 199 days in space and 197 days on the station after their March 26 launch. Laliberte launched with the Expedition 21 crew on a Soyuz vehicle Sept. 30 and returned after nine days on the station." "Lalibert will hold a press conference on Tuesday to discuss his mission which was highlighted by his Poetic Social Mission, an event that spanned the globe during a two hour broadcast on Friday, October 9th." By Keith Cowing on October 10, 2009 1:07 PM. Blasting for lunar H20 on CNN.com - NASAwatch.com's Keith Cowing talks about the rocket that crashed into the moon in search of water. By Keith Cowing on October 9, 2009 8:56 PM. By Keith Cowing on October 9, 2009 4:07 PM. "Page 12 "In the Ares I plus Ares V system planned by Constellation, the Ares I launches the Orion and docks in LEO with the Altair lander launched on the Ares V. This is the system planned by the Constellation Program. It has the advantage of projected very high ascent crew safety, but delays the development of the Ares V heavy lift vehicle until after the independently operated Ares I is developed."
. This paragraph demonstrates either an intentional mischaracterization of the facts or a clear lack of understanding of Constellation." Why is Moving Ares 1-X "Historic"? By Keith Cowing on October 9, 2009 1:05 PM. "Reporters are invited to cover the historic Ares I-X rocket move to Launch Pad 39B on Oct. 19 at NASA's Kennedy Space Center in Florida. The first flight test of NASA's Constellation Program, Ares I-X is targeted to launch on Oct. 27. First motion for Ares I-X out of Kennedy's Vehicle Assembly Building to the launch pad is targeted for 12:01 a.m. EDT on Oct. 19. The 4.2-mile journey is expected to take approximately seven hours. Activities include a first motion photo and interview opportunities with Ares I-X managers. In addition, a sunrise photo opportunity will be available at 7 a.m."
Keith's note: Why is this "historic"? This is not the first time that a large rocket has been moved on the crawler transporter - Saturn rockets were much bigger - and Ares 1-X is mostly built out of dummy parts or systems borrowed from other rockets. So ... why is this "historic"? Or is this "historic" because it is the first time NASA has built only one copy of an expensive rocket with lingering doubts that no more will ever be built? By Keith Cowing on October 9, 2009 11:07 AM. "Fig. 1 Deconvolved 336-nm WFPC2 images of Pallas from 8 September 2007. We observed Pallas at an angular size of 0.326 arc sec and a phase of 4.2, resulting in a scale of ~75 km/pixel. Pallas' spin pole (pointing upward) and south pole () are marked, and the corresponding sub-Earth longitude is labeled; north is up and east is right in this panel." 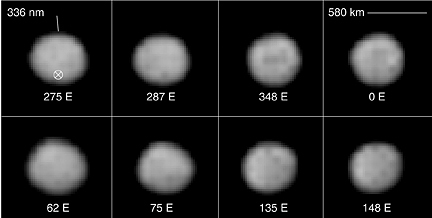 Keith's note: Cool and unprecedented high resolutions images of asteroid 2 Pallas appear in this week's issue of Science - images taken by Hubble way back in 2007. Up until now this world has been just a point of light. Why has NASA not released these images before? Why is there no press release now? Why do people need to go to a for-fee site to see them? How many more is SMD sitting on? It would seem that UCLA and/or Science selectively gave advanced notice of this story and NASA-funded imagery to a hand picked group - but not the rest of the media - or the general public. What does this have to say about the Administration's call for transparency and openness? Not much, it would seem. By Keith Cowing on October 9, 2009 10:38 AM. Keith's note: As was the case yesterday with this NASA Watch posting "Let's Bomb The Moon Into Oblivion Once And For All" JSC IT has apparently once again blocked this NASA Watch posting of CNN video as well. What are these people afraid of? Streaming video? Do they block NASA TV? LCROSS: Where Was That Big Flash? By Keith Cowing on October 9, 2009 9:54 AM. Keith's note: Like everyone else, I was watching NASA TV this morning as LCORSS (the Centaur upper stage and Shepherding Satellite) headed in for an impact on the Moon's south pole. The closing footage reminded me of watching Ranger impacts on the Moon broadcast live on TV as a young boy. Leading up to the impact, NASA produced all sorts of animations showing the impact - a bright plume of glowing debris. There is some precedent for this the Shoemaker-Levy impacts on Jupiter as seen by Hubble and the Deep Impact comet collision as well as other recent moon probe impacts. As I watched the video this morning I was waiting for the flash - as were many other watching TV or peering trough telescopes. Then the time for Centaur impact passed. Nothing. No flash. Did NASA overhype the scale of what might be seen? Or was this a realistic expectation of what might have occurred? So far we hear that an IR signature was obtained and that a dimmer flash might be better for the prospect of water detection. Stay tuned. Watch the videos (below) - actual, and pre-mission - and decide for yourself. There is a NASA press conference at 10 am EDT and I will be on CNN.com at 1:05 pm EDT to discuss this. "But the big live public splash people anticipated didn't quite happen. Screens got fuzz and no immediate pictures of the crash or the six-mile plume of lunar dust that the mission was all about. The public, which followed the crashes on the Internet and at observatories, seemed puzzled." Keith's update: according to the press conference multiple spacecraft such as IKONOS, GEOEYE-1, and Hubble were looking at the impact site as were a number of Earth-based telescopes. Data is now arriving from this suite of instruments. The impact crater has been seen and spectra received. No word yet as to if water was detected - yet. Continue reading LCROSS: Where Was That Big Flash?. By Keith Cowing on October 9, 2009 6:39 AM. Fri, 09 Oct 2009 07:35:47 AM EDT: LCROSS impact into Cabeus. By Keith Cowing on October 9, 2009 6:23 AM. "The last public hearing of a White House space review committee on Thursday ended in a debate over whether NASA's controversial Ares I crew rocket was safer than other rockets and should be scored higher in rankings of the various options the panel would present to the White House. The decision was made to not rate the safety of any rockets, in part because the committee members decided it was impossible to accurately assess the safety of space ships that have never flown before, like the Ares I." "The specific vehicles and systems involved in the missions were not a significant factor, said Ed Crawley, an MIT professor and committee member, in introducing the meeting. Still, some members, notably Bohdan Bejmuk, chair of the Constellation program Standing Review Board, argued that the Ares I should get a higher safety rating than its competitors. "I completely disagree with that assessment," shot back Jeff Greason, CEO of XCOR Aerospace and vice-chair of Personal Spaceflight Federation." "Augustine noted that the committee would not give an overall ranking for the options, since it would require making judgements about the relative importance of the various criteria. "That's beyond the committee's capability," he said. "For example, we're not in the position to judge the possibility of adding funds to the various programmes." "A report suggesting that NASA's space travel goals are too ambitious for its budget is imperiling efforts by Florida and Texas lawmakers to win more money for the agency's budget. The Human Space Flight Committee, which was created by President Barack Obama, said this week that NASA's flight program is on an "unsustainable trajectory" due to its "pursuing goals that do not match allocated resources." By Keith Cowing on October 8, 2009 8:29 PM. "According to the newspaper's report, Constellation Program manager Jeff Hanley told Houston's Johnson Space Center Director Michael Coats in a 3,376-word e-mail that the panel -- headed by former Lockheed Martin CEO Norm Augustine -- ignored "anything positive" about Constellation while making exaggerated claims about alternative systems. "We are betting the farm on severe speculation," Hanley was quoted as telling Coats, a veteran shuttle pilot and mission commander. The e-mail was leaked a day ahead of the Augustine Committee's final public hearing via teleconference today at 1 p.m. EDT and should add more fire to the debate about the future of NASA's human space exploration plans. The committee's final report is expected before the end of the month. The White House is believed to favor major changes in Constellation - including possibly canceling its Ares I rocket -- while several members of Congress say they will oppose any change." By Keith Cowing on October 8, 2009 3:37 PM. The Next JSC all-hands meeting is scheduled for Thursday, Oct. 8, at 2:30 p.m. All JSC team members are invited to join JSC Director Mike Coats in the Building 2 South Teague Auditorium. Coats' comments will include shuttle transition, the Augustine Report, and provide a debrief from the Senior Executive Service summit. This is NASA's first agencywide Executive Summit for all Senior Executive Service, Senior Level and Senior Scientific and Professional leaders. The event provides Administrator Charlie Bolden the opportunity to meet NASA's most senior executive corps and discuss the agency's strategic direction. It will take place Oct. 6 and 7 in Washington, D.C. The JSC All Hands on Oct. 8 will be broadcast live from the Building 2 South Teague Auditorium. JSC team members may view the live broadcast on Johnson TV or on the Web. Continue reading All Hands With JSC Director Mike Coats. By Keith Cowing on October 8, 2009 2:27 PM. "The Augustine Commission notes that the time may finally be upon us when commercial space companies can begin to carry some of the burden of our access to space. Many of these companies are already developing capabilities to enable the commercial resupply of the International Space Station. This ability, according to Augustine, is critical to ensuring our ability to operate the Station beyond 2016 and to maximize the return on what has become a substantial investment. But these commercial endeavors serve another equally important function: they create whole new industries, and with that, new jobs for Americans." "While I commend the Augustine Commission for their hard work, I find many of the aspects proposed in their summary report to be unsatisfactory and disappointing. Mr. President, I am baffled by NASA's path forward on the Constellation program. This program is built on a foundation of proven technologies, using existing capabilities and infrastructure. The Ares I team will soon launch the first test flight and the groundwork for the Ares V heavy lift vehicle is well underway. And yet, instead of simply providing Constellation with funds to move forward, it is delaying the current mission while seeking to have a do-over on plans that have been authorized by both a Republican and Democratic Congress." By Keith Cowing on October 8, 2009 2:01 PM. "The Review of U.S. Human Space Flight Plans Committee will hold a public teleconference on Thursday, Oct. 8, from approximately 1 to 2 p.m. EDT. The only topic for discussion will be finalization of scoring of options the committee presented in their summary report on Sept. 8. This meeting will be held by teleconference only. The teleconference will be open to the public. The service limit is approximately 300 dial-in callers. Public participants will be in a listen-only mode." Keith's note: I tried to dial in multiple times but was told by the friendly robot voice that my passcode was "invalid at this time". I guess that means more than 300 people were dialed in. By Keith Cowing on October 8, 2009 11:07 AM. Keith's note: You can watch/listen to a recording of a live webcast made of Charlie Bolden speaking at the Space Transportation Association breakfast this morning in the Rayburn Building on Capitol Hill at http://www.ustream.tv/channel/bolden-at-sta. Topics covered include last night's Astronomy event at the White House, Augustine Commission, and Green aviation. Continue reading Bolden Live at STA Breakfast (Archived). By Keith Cowing on October 8, 2009 5:43 AM. "I also want to mention my science advisor who is doing outstanding work, Dr. Holdren is here, as well as NASA Administrator Charles Bolden. ... And it was in the years that followed the Soviet launch of Sputnik, the first artificial satellite to orbit the Earth, that the United States would create DARPA, NASA, and the National Defense Education Act, which helped improve math and science education from grade school to graduate school. In fact, the National Medal itself was established just two years after that launch, as a sign to the world and to ourselves of how highly we valued the work of the nation's scientists." By Keith Cowing on October 8, 2009 5:22 AM. President Obama kicked off Astronomy Night on the South Lawn of the White House. Some 150 middle school students from the Washington area got to learn more about their universe using more than 20 telescopes provided by NASA and other organizations. They observed Jupiter, the moon and selected stars. Other activities included science presentations with samples of meteorites and moon rocks. NASA's Museum Alliance, a consortium of museums, science centers and planetariums conducted activities worldwide to coincide with the White House event. Astronomy Night helped note the International Year of Astronomy, a global celebration of contributions to society and culture in the 400 years since Galileo first used a telescope. By Keith Cowing on October 7, 2009 10:19 PM. Keith's note: JSC sources report that JSC IT has blocked access to this post. That's weird. By Keith Cowing on October 7, 2009 7:51 PM. "NASA-Johnson Space Center awarded Modification 1602 of Contract NAS15-10000 to The Boeing Company for Phase II development of the International Space Station (ISS) Common Docking Adapter (CDA) for the United States On-orbit Segment (USOS). This modification, valued at $15,000,000, applies funds from the American Recovery and Reinvestment Act of 2009 to CDA assembly, which includes three major components: (1) Common Passive Docking Interface (CPDI), (2) Tunnel, and (3) Passive Common Berthing Mechanism. A CPDI shall be compatible with docking interfaces of Constellation Program Orion and European Space Agency Advanced Re-entry Vehicle visiting vehicles being developed for docking to the USOS." By Keith Cowing on October 7, 2009 3:08 PM. "I can't believe that they would spend millions to crash two satellites into the moon. Just when i thought that our government couldn't waste any more money..."
Keith's note: Read the comments that go with this article. I have gotten many emails like this. People actually think this way. This is the sort of ignorance NASA needs to confront if it is going to make any headway towards being seen as being relevant to the taxpaying public. The fact that this still happens speaks volumes about how the agency and its supporters currently convey the importance of - and rationale for - space exploration. It also says something about our school system as well. Keith's update: I should have kept my mouth shut. CNN saw this post and I am heading into DC to shoot an interview on LCROSS. By Keith Cowing on October 7, 2009 2:19 PM. Keith's note: The Lunar and Planetary Institute's next MyMoon webcast is Wednesday, October 7th at 8pm Eastern Time. Our guest speaker will be Marjory Wentworth, Poet Laureate of South Carolina. Marjory will spend a few minutes discussing the Moon's influence in her poetry and the rest of the conversation is up to you! You can begin by submitting your questions for Marjory at http://www.lpi.usra.edu/mymoon (click on the webcast poster). Click here on October 7th at 8pm Eastern to join the webcast. By Keith Cowing on October 7, 2009 12:57 AM. "Ad Astra Rocket Company's VASIMR(R) VX-200 rocket prototype reached its highly- coveted 200 kW maximum power milestone at 11:59 am (CST) in tests conducted at the company's Houston laboratory. The DC power trace actually exceeded the design requirement by 1 kW and exhibited the clear signature of a wellestablished plateau at peak power (see graph). The achievement comes after an intense experimental campaign that began last April when the engine was fitted with a powerful low temperature superconducting magnet, a critical component that enables VASIMR(R) to process large amounts of plasma power. The electrical power processing is accomplished using high efficiency, 95%, solid state RF generators built by Nautel Ltd of Halifax, Canada." By Keith Cowing on October 6, 2009 8:01 PM. "Alliant Techsystems Inc. handed pink slips to 420 of its Utah employees on Tuesday, the result of reduced federal government spending stemming from the upcoming completion of two space and defense programs -- the space shuttle and the Minuteman III missile. The company, which makes the solid-fuel rocket booster motors for the space shuttle, announced the planned layoff in July. Since that time, 130 employees volunteered for the layoff, reducing the actual number who received separation notices to 420." By Keith Cowing on October 6, 2009 7:45 PM. Keith's note: Reliable sources report that Morrie Goodman is the current choice at the White House to be the AA for Public Affairs at NASA. Goodman is currently working as a consultant with Hall & Associates LLC in Washington, DC. His prior experience includes a stint at CNN, press secretary at DOC, and Director of Strategic Communications and Emergency Information at FEMA. His name is currently being vetted by OPM. His Twitter is MorrieStory. He is on Facebook too. By Keith Cowing on October 6, 2009 2:22 PM. "This past weekend Zero Gravity Corporation (ZERO-G(R)), the first and only FAA-approved provider of commercial weightless flights, hosted its exclusive ZERO-G Weightless Experience in Washington D.C. ZERO-G awarded 14-year-old Leaunteen Barnes of Howard University Middle School of Math and Science the Zero Gravity Striving for STEM Excellence Award. ZERO-G awarded Barnes the unique opportunity to experience complete weightlessness after she was recognized by her school as the most improved student." By Keith Cowing on October 6, 2009 2:21 PM. "This week marks the beginning of the GalileoMobile Project, a two-month expedition to bring the wonder and excitement of astronomy to young people in Chile, Bolivia and Peru. Supported by ESO and partners, a group of astronomers and educators will travel through a region of the Andes Mountains aboard the GalileoMobile, offering astronomical activities, such as workshops for students and star parties for the general public. Professional filmmakers on the trip will produce a multilingual documentary capturing the thrill of discovery through science, culture and travel. The GalileoMobile is a Special Project of the International Year of Astronomy 2009 (IYA2009), which is a global celebration commemorating the first use of a telescope to view the Universe by the Italian astronomer Galileo four hundred years ago." By Keith Cowing on October 6, 2009 1:34 PM. Civilian Agencies' Development and Implementation of Insourcing Guidelines. GAO-10-58R, October 6, GAO. "None of the nine civilian agencies we visited met the statutory requirement to develop and implement insourcing guidelines and procedures by July 9, 2009. To date, one agency--the Department of State--has issued what department officials characterized as "preliminary" guidelines in late July 2009 and plans to revise its guidelines as insourcing efforts evolve. Officials with the remaining eight agencies informed us that they have efforts underway to develop insourcing guidelines. However, these eight agencies are at various stages of developing their guidelines." "NASA: Drafting interim guidelines. Expected issuance at the end of October 2009." By Keith Cowing on October 6, 2009 11:25 AM. "NASA astronaut Fernando "Frank" Caldeiro died Saturday morning after an extended illness. Caldeiro was a member of the Astronaut Class of 1996 and most recently was assigned to the WB-57 High Altitude Research Program within the Aircraft Operations Division at Ellington Field in Houston. In that role, he directed the integration and conducted the operation of high-altitude atmospheric research experiments carried on board the NASA WB-57." By Marc Boucher on October 5, 2009 2:35 PM. We've upgraded our content management system and in doing so we've initiated some changes including requiring users to create an account before being allowed to comment. We know some of you like being anonymous when commenting and you can still remain anonymous to other users by picking an obscure username and not including any personal information in your profile. And you can rest assured that the email address you use to authenticate your account will remain private from users. If you're having problems registering or commenting we have setup a support page and email address for you to contact us. As well starting today you can sign in and comment using any of the following services if you have an account with them; OpenID, TypePad, Yahoo and Google. By Keith Cowing on October 5, 2009 11:44 AM. @nasawatch: Hey @whitehouseostp - wow ... 4 tweets since April. Not too good for a WH that prides itself on being uber tech savvy and cool. Fail. By Keith Cowing on October 5, 2009 10:43 AM. "This month marked the end of a very long era for aeronautics and aerospace researchers. After nearly 80 years of service, the Langley Full Scale Tunnel has ceased operations, and the expectation is that NASA will tear down the venerable structure, which is located at the aerospace agency's Langley Research Center in Hampton, Va. The final mission for the immense wind tunnel, built when biplanes were still the norm for aviators, was to test the aerodynamics of the futuristic X-48C and its blended-wing body." By Keith Cowing on October 5, 2009 10:08 AM. "If you're an early riser, head to the Newseum for an observing event featuring NASA's Deputy Administrator Lori Garver and the museum's 40-foot high-definition media screen. Doors open at 6:30 a.m., program starts at 7 a.m., LCROSS's first satellite is scheduled to impact the Moon at 7:25 a.m. and the second at 7:30 a.m."
By Keith Cowing on October 4, 2009 10:57 PM. "I asked a question about managing the complex issue of astronaut appearances, and offered a potential solution -- astronaut career assignments in NASA Headquarters Office of Public Affairs and Office of Legislative Affairs. ... Lori's response: NASA Administrator Charlie Bolden, former astronaut, would call the shots on how the Astronaut Corps operates. She mentioned that Charlie met with the new 2009 Astronaut Class, and encouraged them to act as Space Ambassadors (my paraphrase of her answer) during the many years before they fly a space mission. Appropriate response to the question. Now let's focus on the reaction among my NASA colleagues following the Town Hall meeting. Here's a sample of what I heard the rest of the week ..."
By Keith Cowing on October 4, 2009 7:24 PM. "The White House event for middle-school students will "highlight the President's commitment to science, engineering and math education as the foundation of this nation's global technological and economic leadership," according to a White House statement. "The event will include 20 telescopes on the White House lawn focused on Jupiter, the Moon and select stars; interactive dome presentations; and hands-on activities including scale models of the Solar System," the White House said." By Keith Cowing on October 4, 2009 11:00 AM. "The first round of what are expected to be thousands of layoffs of space-program workers starts today, Friday,with 258 shuttle contractors losing their jobs in anticipation of the space shuttle's retirement next year. In addition, nine employees of rocket-maker United Launch Alliance also received pink slips Thursday, along with about 70 security workers at Cape Canaveral Air Force station. The 337 layoffs are the first of what local officials estimate will be 7,000 space-program job losses by the end of 2010. The 258 shuttle workers were employed by United Space Alliance, which services the shuttle for NASA, and most volunteered to leave. About 20 more will be leaving next week." By Keith Cowing on October 3, 2009 11:58 AM. "National Aeronautics and Space Administration (NASA). The Administration is concerned with the reduction of $670 million from the President's FY 2010 request for Exploration Systems. This large reduction would likely cause major negative impacts to any options that may emerge from the ongoing blue ribbon review of U.S. human space flight plans. The Administration appreciates the Committee's strong support for the NASA Earth science program, which advances the President's goal of deploying a global climate change research and monitoring system. ..."
By Keith Cowing on October 3, 2009 11:49 AM. "Actors Matthew McConaughey and Salma Hayek, singers Joss Stone and Elisapie Isaac, musical group Ladysmith Black Mambazo, Bolshoi Ballet principal dancer Nicolai Tsiskaridze and poet Touria Ikbal join former U.S. Vice President Al Gore, U2, and others in the effort to tackle the global water crisis. 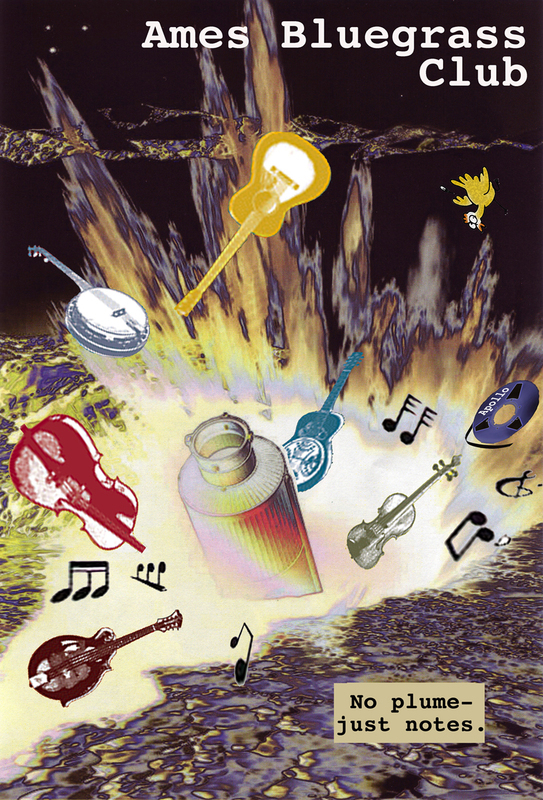 A 120-minute global event featuring musical performances by major international artists and the reading of a poetic tale by well-known celebrities, the Poetic Social Mission seeks to raise awareness through artistic illustration of the humanitarian struggles and solutions associated with water." By Keith Cowing on October 3, 2009 10:27 AM. "In 1946, when the U.S. Army formed its Rocket Research Panel, only a tiny fraction of the nation's astronomers, atmospheric scientists, biologists and solar physicists appreciated the power that access to space would have on their research. Yet just a decade later, rocketborne research had become so powerful a tool that it formed the centerpiece of space efforts in 1957's International Geophysical Year (IGY). Today, in late-2009, the research community is very much "in 1946" regarding the powerful opportunities that next-generation suborbital vehicles like Virgin Galactic's SpaceShipTwo, Blue Origin's New Shepard, XCOR's Lynx and others offer for research, education and public outreach (EPO) activities in space." By Keith Cowing on October 2, 2009 8:42 PM. "On 2 October 2009 a group of teachers from Washington DC, Virginia, and Maryland participated in Northrop Grumman's "Weightless Flights of Discovery" program. This experience involves flying a series of parabolas aboard Zero Gravity Corp's G Force One jet during which you experience periods of weightlessness. After they returned to Earth, SpaceRef/OnOrbit caught up with two of the teachers, Catherine Bloedorn from Hammond High School in Columbia, Maryland and Jane Carter from Castlewood High School in Castlewood, Virginia and asked them to describe their weightless experience." By Keith Cowing on October 2, 2009 4:40 PM. "A much anticipated independent report about the future of NASA and human space flight probably will not be sent to President Barack Obama until the middle of October, a spokesman for panel told The Times today. "I don't see a firm date just now," said Augustine Commission spokesman Doc Mirelson. "What we are seeing is probably the second week of October." Keith's note: As such it is unlikely that the White House will have anything definitive to say until perhaps a few days before Thanksgiving. "The Review of U.S. Human Space Flight Plans Committee will hold a public teleconference on Thursday, Oct. 8, from approximately 1 to 2 p.m. EDT. The only topic for discussion will be finalization of scoring of options the committee presented in their summary report on Sept. 8. This meeting will be held by teleconference only. The teleconference will be open to the public." By Keith Cowing on October 2, 2009 4:18 PM. "Dr. Franklin Chang-Diaz believes there's a better, more modern way of doing business in space. And unlike many other starry-eyed space-age dreamers, Chang has considerable clout to back him up. A former NASA astronaut, he's flown into orbit on a record seven space shuttle missions, including the one that sent the Galileo spacecraft to Jupiter. And for the past 30 years, Chang has been developing a concept that could revolutionize space travel and commerce: an advanced plasma rocket engine called VASIMR." By Keith Cowing on October 2, 2009 3:49 PM. "On October 4, 2009, the X PRIZE Foundation will celebrate the fifth anniversary of the largest prize in history, the $10 Million Ansari X PRIZE - won by the Mojave Aerospace Ventures team for the historic flights of SpaceShipOne. Led by famed aerospace designer Burt Rutan and backed by Microsoft co-founder Paul Allen, Mojave Aerospace Ventures was the first private team to build and launch a spacecraft capable of carrying three people to 100 kilometers above the earth's surface twice within two weeks. The team made world history when it achieved this feat on the anniversary of the historic launch of Sputnik in 1957 - the first man made object that entered earth's orbit and opened the space age."